Biking across the Golden Gate Bridge offers beautiful views and brisk breezes. But on a pleasant August afternoon there are just too many people swarming this iconic landmark. On weekdays before 3:30, only the eastern span is open to pedestrians and bicycles. Clear, regularly-placed signage indicates that pedestrians should walk on the eastern half of the span and cyclists – going both directions – should use the western half of the same walkway. As you can imagine, it isn’t wide enough. The hazards of the cramped space are compounded by clueless tourists meandering every which-way, large groups spreading across the entire width, and cyclists who appear unsteady on two wheels. I spied one young couple on a tandem, the guy up front toiling away while his girlfriend tucked her feet up on the bike frame – too busy taking selfies to bother pedaling. On my return trip back across the bridge I had to regularly call out to wandering pedestrians, “please walk to the left.” With the noise of wind and car traffic, I had to use a louder voice than I would have liked. And then it happened. One young man, paying no attention to where he was walking, took offense at being asked to move over. “Don’t have a heart attack old lady,” he yelled at me. Old lady, hurled at me as an insult. It was a low blow. Sure, I probably delude myself that I look younger than I do. But old lady??? 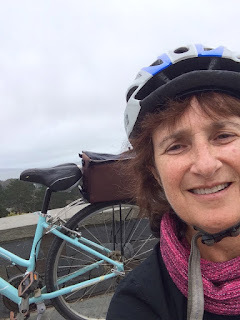 Once the crowds diminished, another “old lady” riding behind me the whole way said, “let me talk to you when we get across.” She was about my same vintage – early 60s – and clearly a very fit, regular San Francisco cyclist. She vented her frustration about the hordes of tourists who are encouraged by the bike rental companies to cycle across the clogged bridge without having basic cycling skills or knowledge of bike etiquette. She didn’t know I was a visitor myself and she took the sting off the “old lady” comment by telling me, “I could tell you really knew how to ride.” It’s not easy going at slow speed, keeping your balance, weaving around the crowds. I was glad to have my old lady cycling prowess acknowledged by a kindred spirit. But enough about the frustrations. I rented my bike at Golden Gate Bicycle Rentals near Golden Gate Park. There was quite a crowd of people getting bikes and they had several models – a rather awful-looking “comfort” bike, mountain bikes, and a nice city bike. The rental guy was about to give me a “comfort bike” when he saw, perhaps, the distressed look on my face, or possibly caught a glance of my big bicyclist thighs. Whatever it was, he said, “You look like you bike a lot…I’ll give you this one” (the nice city bike). A tourist in a large group got the comfort bike. I suspect she wouldn’t have appreciated the difference. Lucky for me the bike guy didn’t discriminate against “old ladies” – and the 24-speed Specialized was a worthy mount for my afternoon adventure. 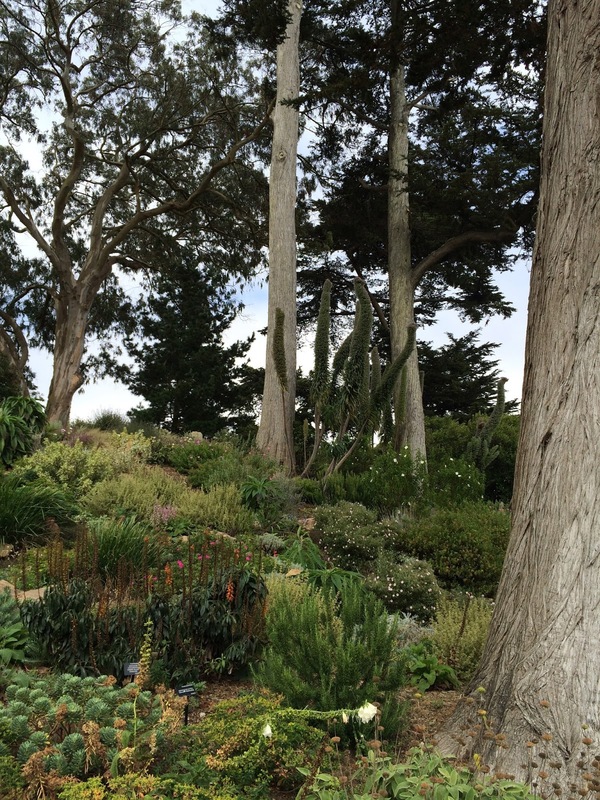 We were advised to take Arguello Avenue north to the Presidio as the flattest route. Even so, there were a few substantial up-hills, but nothing this old lady couldn’t handle – albeit using the “granny gears” a few times. The signage for bike route 65 to the GG Bridge could have been a bit clearer, but I found my way, riding up and up through the Presidio to the entrance for the bridge. 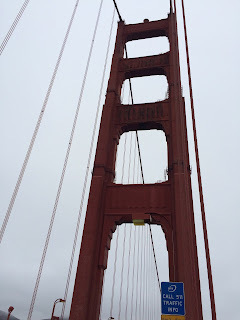 After my trip back and forth across the bridge, I took the coastal route west, joyously coasting down a huge hill from the top of the Presidio to sea level. 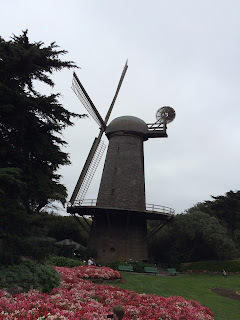 I entered Golden Gate Park at 25th Avenue, rode west to the ocean on the bike lane of the main road (stopping to snap a photo of the windmill) and then south to the other corner of the park, traveling along the ocean to the other windmill. Going east I took the park’s very nice bike path, past the polo field and many groups of picnickers enjoying the lovely day. Because of glitches on the BART, it had taken me two hours to get from my airport hotel to the bike rental near the park – a trip that ordinarily would have taken just an hour. Once I finally got on the bike, I immediately felt my grumpiness vanish. The same thing happened after finishing the less-than-jubilant ride across the bridge. Once I could cycle without impediment, I was a free spirit on two wheels – whether riding into the wind or enjoying it at my back. Riding a bike cures many ills. I returned the bike after three happy hours and decided to walk to the BART stop at 16th and Mission – where I planned to enjoy a taco before returning to my hotel. I walked east on Haight Street, glancing south now and then to find the flattest route. 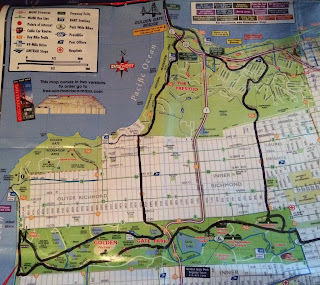 Suddenly I realized I was walking along the San Francisco “wiggle” – a route I biked last year. 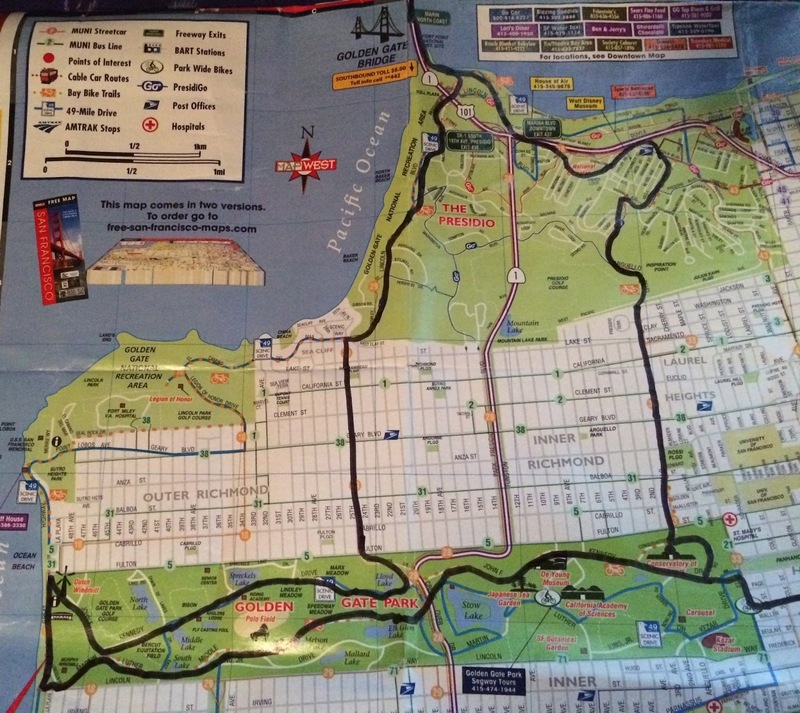 It’s a clearly marked east-west bike route designed to help cyclists avoid SF’s infamous hills. Riders (or pedestrians) travel through the valleys. The wiggle is equally great for walking as it is for cycling! By the time I reached the Mission district, I was ready for my taco. It was just a quarter to five, but when I saw a line snaking out the door at Pancho Villa Taqueria I knew it was the place to go. Delicious pureed red beans, grilled vegetables, salsa, and guacamole atop two fresh tortillas, plus a basket of chips and a choice of about 15 salsas – I devoured it all. I had worked hard and my body felt it: a good physical exhaustion. At one point I realized I had dozed off on the BART, but I’m sure there was a smile on my face.